Occasionally a property of special character, location and history becomes available in the coveted area of Central Piedmont, CA. 210 Crocker Avenue is one of those properties. Sidney B. Newsom and Nobel Newsom, prominent San Francisco architects were commissioned to design 210 Crocker for Carmen Ghirardelli of San Francisco’s Ghirardelli Chocolate family and husband George Baker Jr.
From the moment you approach this Classical Mediterranean property the details of this 1920’s architectural masterpiece become apparent. While the home is stunning, the grounds and gardens at just under a half-acre is even more spectacular. The home is wonderfully set back from the street and rises up over a large, flat manicured lawn. You’re swept up the walkway to garden beds filled with mature plants of multiple verities. Your eyes are drawn to the visually stunning wrought-iron arched gates gracing driveway portico. At the South end of the homes frontage is an arched-topped wooden gate accented by heavy iron strapping that leads you to the rear formal gardens. Entering through the heavy wooden and iron detailed main entry door it becomes apparent that words alone cannot express the feelings evoked by this amazing property. Even photos cannot do it justice. From the warm hardwood floors, box beamed ceilings, charming original light fixtures to the many glass French doors opening out the terra cotta tiled patio, the subtle grandeur of this amazing home is unlike any other. The main level contains the kitchen, family room, breakfast area, formal dining and great room. It also has a bedroom (currently the library) with attached bathroom. Upstairs there is an expansive Master Suite and 3 additional bedrooms that open out to a Romeo and Juliet balcony overlooking the patio below and bubbling garden birdbath fountain beyond. Additionally there is also a separate detached Cottage with 1 bed, 1 bath and full kitchen. Prior to the current owner, only 2 owners have called this unique property their home. 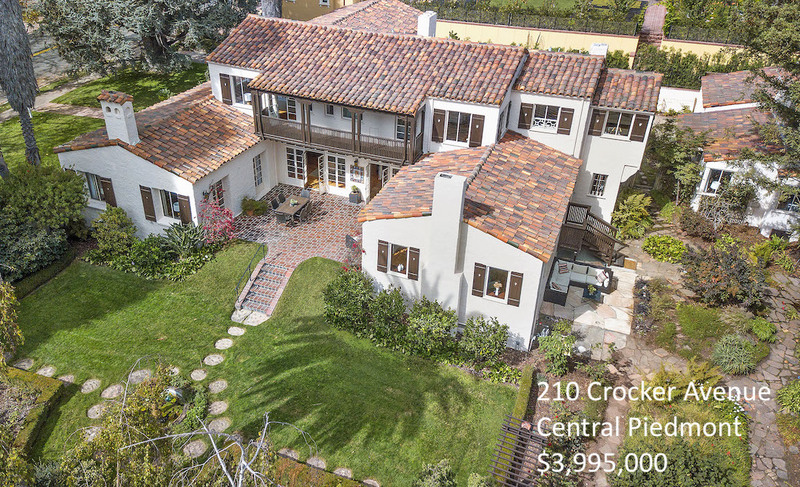 The Location, Character, Architectural Significance, Quality, Size and Gardens combine to make 210 Crocker Ave. a one-of-a-kind property that’s just waiting for its next lucky steward. 5th. Bedroom (currently used as Library) perfect for future level-in bedroom suite? While the Ghirardelli family worked in San Francisco, the majority of the family members in the early 1900s lived in Piedmont and Oakland. Several family members lived near Carmen’s 210 Crocker house in the early 1900s. A Ghirardelli family lived at 200 Crocker, Carmen’s sister, Juanita, lived at 201 Crocker, and Carmen’s mother lived at 636 Highland Avenue. Carmen and George Baker lived in the Crocker house from 1925 to 1950. They had two sons and a daughter. The children used the vacant lot next door for a pasture for a goat, pony, and other animals. The children held circuses in the field and often included the family monkey. The tool house in the back of the property was a stable for the animals. From 1950 to 1975 Charles DeVaul, an Oakland ophthalmologist owned the house. He was a camellia enthusiast and breeder. Many of his camellia trees still thrive and bloom actively on the property. The two previous families who occupied this house stayed for 25 years each. Having lived in this house for 43 years it is well past time for me to move on and leave this historic home to another family.